On 8 July, 2009, Adnan Hajizada, a video-blogger and co-founder of the the OL! 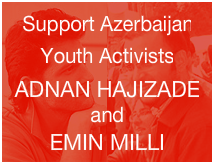 Youth Movement, and Emin Milli, co-founder of the Alumni Network grassroots youth movement, were seriously beaten by unidentified persons while dining with a group of other civil society and youth activists in a downtown Baku restaurant. After reporting the incident to police, the two activists were instead detained for 48 hours. However, despite international outcry, the two activists were placed in pre-trial detention while a criminal case was opened against both. By the time of their final court hearing on 11 November 2009, Hajizada and Milli had been held in prison for over four months. Local human rights activists expressed concern about the conduct of the trial which eventually ended with a sentence of 2 years in prison for Hajizada and 2.5 years for Emin Milli.The Presidency of the European Union, Parliamentary Assembly of the Council of Europe (PACE), Organization for Security and Cooperation in Europe (OSCE), Human Rights Watch and Reporters Without Borders condemned the verdict. On 21 November, a petition of appeal against the verdict was submitted by the two men's lawyer. Amnesty International declared both men to be prisoners of conscience. Like Milli, Hajizada is a prominent member of civil society and very well known among youth activists for his Youtube videos (look up: fuserlimon and olmedia). Some of these videos had an educational character in order to educate foreigners about Azerbaijan better while others carried subtle political messages (a video on imported donkey which cost $41,000 or the flowers on lampposts in the streets of Baku). He was also the main force behind several OL! online and offline campaigns. On 18 November 2010, despite earlier petitions for an early release, an Appeal Court in Baku ruled that Adnan Hajizada should be set free on conditional release. The video blogging youth activist spoke to journalists afterwards saying that he would still continue in his activities, including making video posts on YouTube. Along with many of his supporters, Hajizada also reminded people that Emin Milli remains in prison. 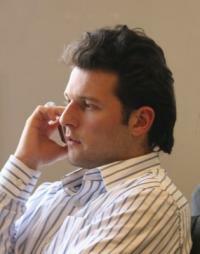 The next day, Emin Milli was also released. Global Voices covered the detention, trial and imprisonment of Adnan Hajizada and Emin Milli in its Azerbaijan section. The hashtag #EminAdnan was used on Twitter.